LEDs have traditionally dimmed at the same color temperature as when they were at full power. With the advent of warm dimming solutions, LEDs are now able to produce the same aesthetically pleasing effects as an incandescent light or halogen lamp. This occurs because of red or amber LEDs added to the fixture or lamp, creating an effect that is particularly suitable for application in homes, restaurants, hotels, spas, resorts and other locations where the intended atmosphere is cozy or relaxing. Warm dimming enhances the aesthetics of LED lighting, simultaneously enhancing the well being of individuals in LED-lit environments. Looking for further enhanced or added functions in LED lighting applications? 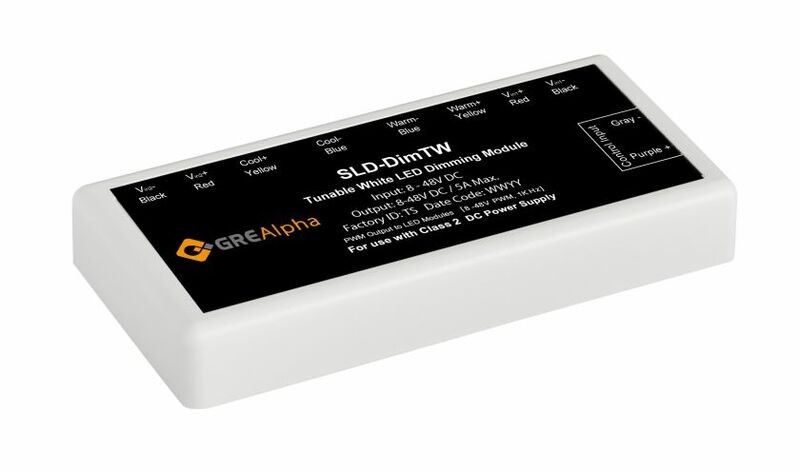 GRE Alpha’s Two Channel SLD-DIM2 0-10V Dimming Module and 7-in-1 Dimming Module (model XDL-7DV1-48V5A) offer further options in warm dimming. The Two Channel dimming module offers 0/1-10V PWM dimming with no shift in LED color temperature, up to 1024 dimming levels of high resolution smooth dimming and 97 percent efficiency. Additionally, GRE Alpha’s 7-in-1 LED dimmer provides full range zero to 100 percent high resolution dimming performance for constant voltage LED dimming applications. Boasting flexibility and easy installation, the 7-in-1 has a multi-colored LED indicator, integrated strain release cover, settable dimming transfer characteristics (linear or logarithmic), and built-in thermal shutdown with auto restart and overload protection. Visit www.grealpha.com for more information on these and other products. GRE Alpha is committed to innovation and to delivering high-quality, leading-edge LED LED lighting solutions. For more information about LED drivers, dimming modules and accessories, or to speak with a GRE Alpha product expert, visit the Enquiries page and fill out the Enquiry Form. Sign up for the GRE Alpha newsletter to stay up-to-date on new products and for early access to other GRE Alpha news.